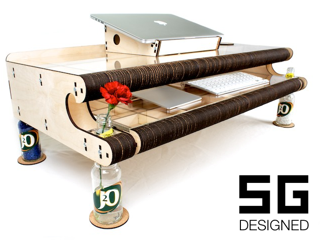 The last 30 days I had a project running on Kickstarter — SG Designed Laser Cut Standing Desks. The project sadly failed to reach my funding goal, instead reaching 11%. I want to explain to my backers and anyone else who's interested what I think went wrong. I got some good publicity for this project, including a post on the popular blog Boing Boing. This happens to be one of my favourite blogs so I was ecstatic about that. I also got phone interviewed by 2 local papers and photographed by one (really lovely reporters). However, I didn't get the long list of posts and features some other Kickstarters get, and I think without this the traffic to the Kickstarter was simply too low to bring in enough sales. In hindsight I didn't email enough blogs and I wasn't persistent enough. I don't like being pushy but I think that's the way publicity has to be. I've certainly learned a lot about the ways of communicating with blogs that work, and ways that don't. I love my SG Wave standing desk. I designed it so you'd expect me to say that, but I do think it has a wonderfully unique design and features. Lots of other people liked it too: Backers of nearly all reward levels, Retweets from people in the London tech scene, Loads of positive feedback in comments, messages, forums, emails etc. So if the product was good, why didn't it sell? I believe the biggest problem was price. I heard from a few people that they liked the product but couldn't afford it. This is totally understandable as £549 is a big chunk of money for a desk. I never wanted to sell it for that much, but my hands were tied. The desk is laser cut which is an expensive process, uses premium materials, and has many components. All together it adds up, I pushed my suppliers to get the price down, so what you saw on the Kickstarter was as low as I could get it. This was the first video I've done. I found it very difficult sounding natural when talking at a camera, so it came across rather flat. My equipment wasn't great either, so overall it came out less than perfect. I wasn't entirely happy with the video when I launched, but it was the best I could do. A few others have mentioned that the video wasn't great, so this could have contributed to the poor sales. However, Kickstarter is all about people starting new things, so I don't think having a perfect video is essential. One person liked the video even. The stats also tell me that 22% of viewers watched it all the way to the end, so it can't have been too bad. People have encouraged me to try again next year and run an improved Kickstarter. I put hundreds of hours into this project, I'm not sure I have the energy to do it all again right now. However, a few months off doing other things might be just what I need to gather energy and build up some new ideas. If I do try this again, I will improve on the three areas — reduce price, increase publicity, improve video. The biggest issue will be price. I love the design I've created, but I know that without significant changes it can't be made any cheaper. This is difficult for me because the desk is just what I wanted, so how can I change it without making it worse? I am a determined person though and will never create anything that I'm not proud of. If I do launch again you'll know I've found a way to make the design cheaper while still matching my high standards. It's going to be a challenge. I have a videographer friend who may be able to help out with a better video. And I now have some experience with blogs so I'll try extra hard using my new knowledge to get some more publicity. Overall, this project has taught me a lot. While I didn't reach the funding goal I don't see it as a failure. There's a lot I can take away from this, and it doesn't have to be the end. Moreover, all the great comments I got and my backers put a huge smile on my face and validated this for me. Until next time, thank you. I'd be very grateful if you sign up to receive occasional emails from me on future projects (such as the potential relaunch of this). Sign up is via one of my other projects. Emails will be less than monthly, easy to unsubscribe from, and I'll never share your details with spammers, promise.